What can you offer that your competitors can't? As a property management executive, you are always looking to differentiate yourself from the competition. If you are consistently losing out to national brands, it's time to make a change. At SVN, we are focused on providing our franchisees with opportunities to stand out from the crowd; and not just by being a national brand. One of the tools that we provide our franchisees is our Master Insurance Program. Significant savings on premiums while increasing the coverage on assets. 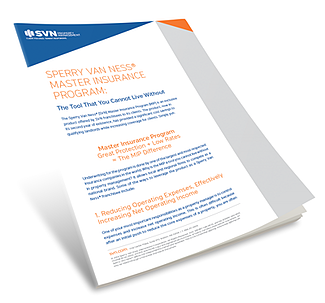 Leveraging the Master Insurance Program as a competitive advantage to prospect and potentially win new business. Current success stories with this program. © 2018 SVN International Corp.
All Rights Reserved. SVN and the SVN COMMERCIAL REAL ESTATE ADVISORS Logo are registered service marks of SVN International Corp.
All SVN® offices are independently owned and operated. This is not a franchise offering. A franchise offering can only be made through a Franchise Disclosure Document.